On-Track Plant can be described as railway machines that can run under their own power but are neither locomotives nor railcars. 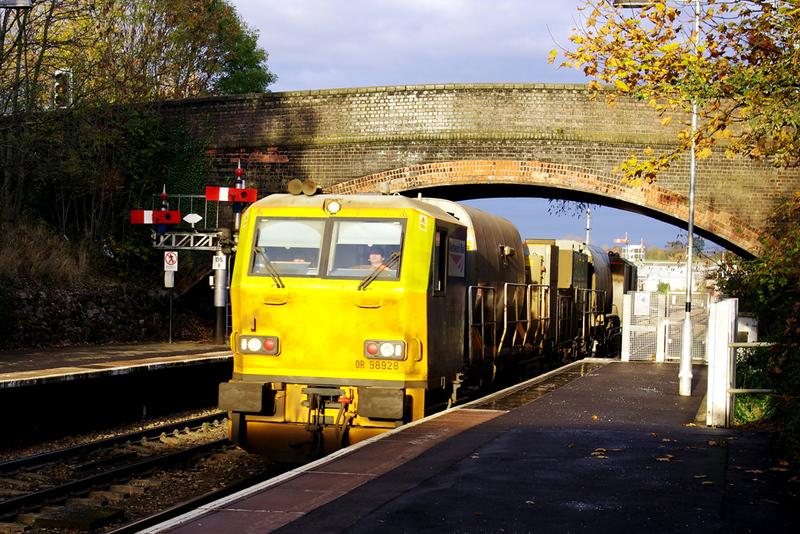 Most likely, but not always, they are painted in a yellow livery and they are used for the maintenance of the railway. 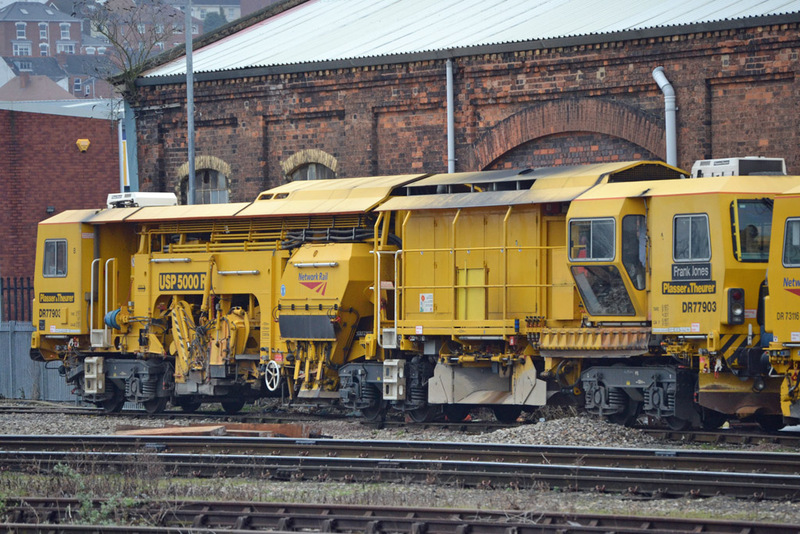 Because there are dozens of different types of track machine, any or all or which could appear in Worcestershire, this page does not attempt a comprehensive analysis of the subject but instead gives examples of various types seen in the county. No.DR77903, Plasser & Theurer type USP 5000 RT Ballast Cleaner (No.796 of 2005), carrying the name 'Frank Jones' (a former Reading signalman) was stabled in the sidings behind Worcester Shrub Hill Station on 19th February 2011. 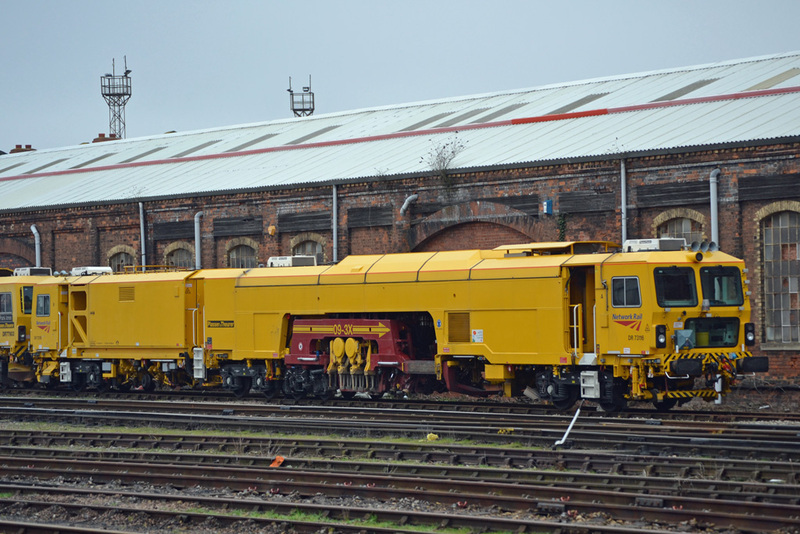 Also at Worcester on 19th February 2011 was No.DR73116, a Plasser & Theurer class 09-3X-D-RT Tamper. No.99709 940222-1, Hydrex owned Rexquote/Case 988P Superailer excavator (fleet No.3739, build No.CGG0232153, conversion No.1511, was present at Newland, near Malvern on Saturday 19th February 2011. 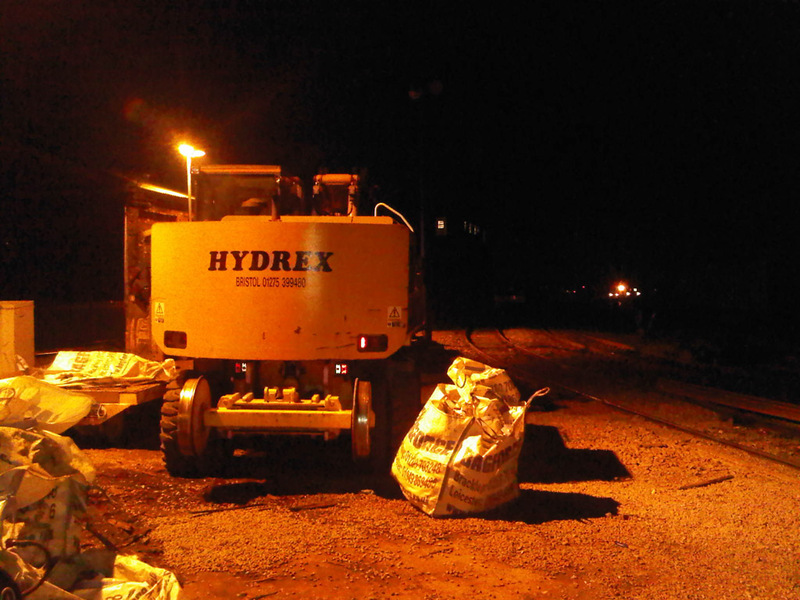 This night shot of Hydrex rail-railer No.99709 940242-9 stabled off the track alongside the sidings behind Worcester Shrub Hill Station was taken on 7th March 2011. Photograph taken by Andrew Smith. 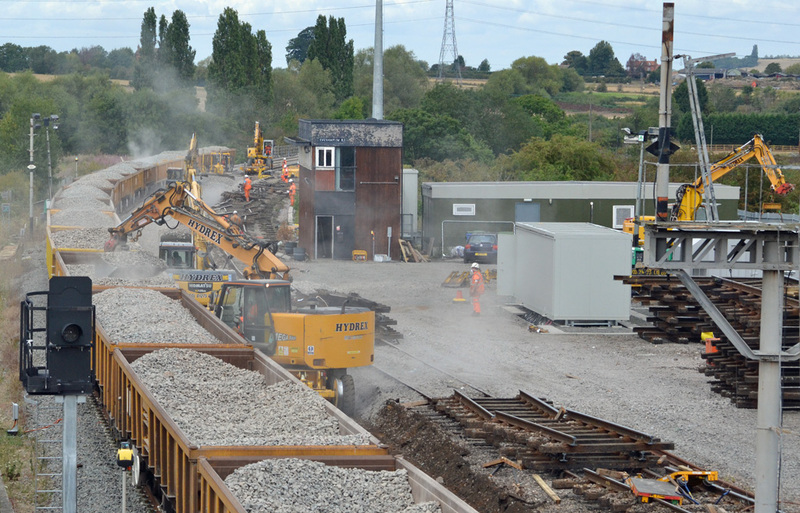 There are at least five road/rail items in this photograph which shows work underway to unload a ballast train at Evesham. The train is on the 'down' line and the ballast is intended for the 'up' line. 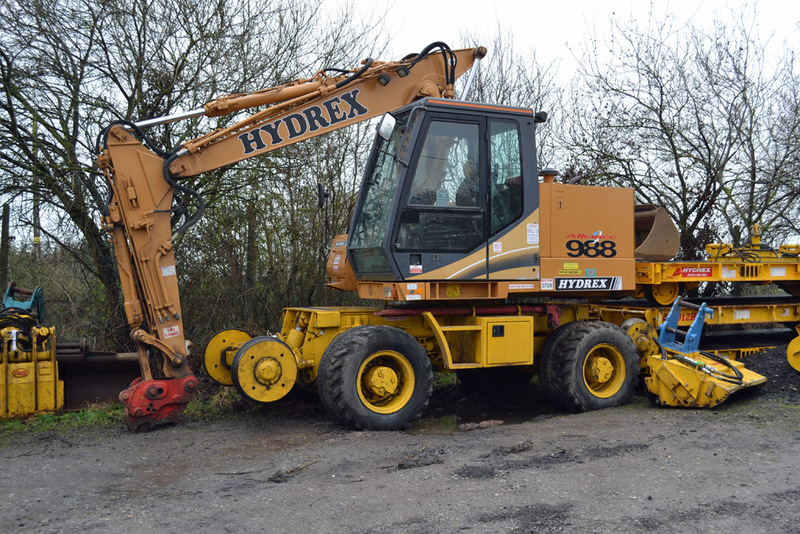 Nearest to the camera is Hydrex-owned No.99709 940240-3, behind which is a Hydrex-owned Komatsu type PC138US 'Crawlerailer'. At the far right in the photograph is Hydrex-owned Rexquote 'Gigarailer' No.99709 940088-6. Photograph taken by Andrew Smith. Pete Wilcox took this magnificent photograph of MPVs No.98928 and 98978 working out of Kings Heath Depot to Ledbury and back. Photograph taken on 23rd November 2013.